Franz Kafka’s The Metamorphosis begins with one of the most famous lines in all of twentieth-century literature: “When Gregor Samsa awoke from troubled dreams one morning, he found that he had been transformed in his bed into an enormous bug.” Depending on the translation, Gregor is sometimes transformed into a “monstrous vermin,” but the import is the same. An unprecedented change has occurred, something very much like a dream, but very real. When students start to read this story about the giant bug-man, I usually see two reactions. First, the science-fiction fans perk up, and start to make comparisons to films (The Fly, Alien, etc) where they have seen similar transformations. Other students check out, clearly not interested in getting invested in some strange book about a giant cockroach. In high school, I would have been among the latter group. Why read weird sci-fi when regular human life gives us plenty to think about? The key to getting your mind around Gregor and his metamorphosis, I tell my students, is to understand that his is not a science-fiction story. Kafka does not explain how the transformation happened, or under what conditions or for what reason. In fact the change does not happen in the story at all, but before the story begins, presumably while Gregor sleeps. We never see Gregor’s appendages mutate into “numerous legs, pitifully thin,” nor his torso change into the hard, rounded shell of the bug. It has already occurred. 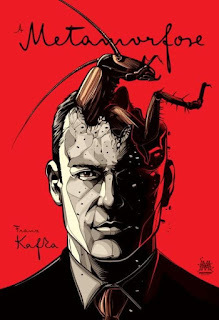 While a science-fiction story would spend more time on the nuts-and-bolts of the transformation, Kafka’s story pays no attention to it at all; it is that thing which brings the story into existence in the first place. If not science-fiction, then, what kind of a dimension are we in? Kafka was a practitioner of the grotesque, a style that has its roots in medieval times, and whose literary lineage can be traced from pre-modern theater through such varied writers as Dante, Hawthorne, Poe, and Flannery O’Connor. Though the grotesque is on one level one artistic style among many, it also a way of comprehending the world, a lens that looks through everyday appearances to something the artist believes is more real, to the true nature of things. Grotesque art often draws our attention through its morbid distortions, and exaggerates something already present in human life to such a degree that the audience cannot ignore it. This distortion hinges on our recognition of it, and therefore the grotesque occupies the ground between familiar and unfamiliar—it takes something we recognize and stretches it towards unrecognizability so that it appears strange, but not other. The manner of the grotesque, then, depends upon what the audience is able to process. This was an important reality for Flannery O’Connor to consider as she wrote her short fiction. She considered her modern readers to be effectively blind to spiritual matters, and concluded that her job was, therefore, to “draw large and startling figures” for them. Gregor Samsa, in all his bug-ness, I’d argue, is about as large and startling a figure as you will find in modern literature. But what is he a distortion of? What familiar reality has Kafka stretched into strangeness so that we cannot avert our eyes any longer? I have heard many hypotheses for what the bug-Gregor embodies, what reality his insect form brings to the surface. Many critics stress Kafka’s difficult relationship with his own father as a source for Gregor’s estrangement from Mr. Kafka—the latter, a failed businessman, from the start of the story has no interaction with Gregor that is not a physical struggle; in fact, he inflicts the wound that eventually does Gregor in. Others refer to Kafka’s experience as a Jew to explain his motive for creating an estranged creature. Both of these theories have substantial merit, I think. For my purposes here, though, I want to focus on another one—Gregor’s relationship to modernity, that is, to the period, early in the last century, that ushered the mechanization of industry into nearly every aspect of domestic life. The Metamorphosis was written in 1915, at the vanguard of these changes, when the world seemed to be spinning, as everything from travel to communication to the production and distribution of goods accelerated at a rate unmatched in the rest of human history. After Gregor wakes up, his first thought is “What’s happened to me?” but he quickly turns to other, more practical concerns. He wants to go back to bed to put an end to “all this foolishness,” then spends a good deal of time thinking about how terrible his job is. Gregor bemoans the train schedules, the meals, hotels, and, above all, the fact that his work provides him with no lasting human relationships. He feels overworked, isolated—not like a human being at all. It’s important here what Gregor doesn’t think about—the fact that he is a gigantic bug. His thoughts never return to “What happened to me?” for there are more pressing matters to which to attend, namely, work. He sees that he has slept through his alarm and has missed his train, and starts to panic about being late for his job. He frets about someone from work coming to rouse him, and sure enough, it happens—his manager arrives, cane in hand, and demands that Gregor explain himself. It’s a scene out of a nightmare. The most unnatural thing in Gregor’s life isn’t that he’s changed into a bug—it’s that he tries to live and work in the gear-teeth of the modern world. Kafka himself worked as a traveling insurance salesman and experienced Gregor’s line of work first-hand. (Interestingly, he never tells us directly what Gregor sells, but he does refer to the “fabric swatches” on the table by his bed, so perhaps it’s something domestic, like drapery or clothing or upholstery.) And yet, disorienting as that life perhaps was for Kafka, he felt the need to distort it through the grotesque in order to bring out its true colors, to reveal its dehumanizing effect on the individual, and the destruction of the life of the family. The Samsas are a miserable, ineffectual lot, and it’s significant that the one person who has the power to force the initial situation to its crisis (Gregor is locked in his room and no one yet knows that he’s a bug) is the office manager. When Gregor emerges, the manager flees, the father chases him back into his room, hissing at his son, and the mother faints into the breakfast dishes, which come crashing to the floor. The harmony of the home, if it ever had existed, shatters along with the dishes, it seems. As the story spirals to its necessary conclusion, the bonds that unite the family come undone. There’s a good argument that the title refers not to the change of Gregor from human to bug (which never actually occurs in the story itself) but to the transformation of his family members from those who act like humans into those who act like bugs, especially Grete, Gregor’s beloved sister. Her treatment of him devolves from awareness of and concern for his needs to tolerance for his existence to disdain (she calls him “it” by the end of the story). At the story’s end, after Gregor curls up and dies, the Samsa family, no longer burdened by their hideous son, leaves the apartment and find hope in the thought that Grete, young and beautiful, is in a position to marry a good, successful husband, and restore to the family some respectability. They are happy the embarrassment of Gregor is behind them. I don’t want to turn Kafka into a moralist here and make him out to be some propaganda artist who used a fantastical story to teach his readers the lesson that modern life ruins families. There’s much more going on in this story than that (and even if we could reduce the story to a “moral,” I don’t think it would be so straightforward). Yet one can sense an urgency, even despair here, and recognize in Gregor’s story a darker version of Wordsworth’s lament that “Getting and spending, we lay waste our powers” or Hopkins’ “All is seared with trade; bleared, smeared with toil.” These poets' sentiments are primarily about how industry, by separating us from nature, also separates us from ourselves; Kafka’s follows something more insidious—modern industry, by changing our daily habits and routines, absorbs us into itself, away from each other, and we grow isolated to the point that we, like Gregor, choose death over life. The challenge for Kafka was to make this come to life for an audience for whom, even as early as 1915, modern life had become regular, something that one rarely thought about any more than we, today, might think about the existence of the internet (it is just there, as the walls and roof of our houses are there). More difficult was the fact that Kafka was trying to draw our attention to the quality of modern life, which is something invisible, and all good art must present itself in the world of the senses. He chose the grotesque as his medium, and he must have made a good decision, for his short novella, over a century after its publication, stands as prominently as any work of fiction in Western literature. I imagine that some of that has to do with the preposterousness of Gregor’s figure and the dark humor of the Samsa’s story. They are hard to ignore, which was his goal.